Let’s start with a quick look at analyst revenue expectations. As a quick refresher, “pre-guidance” means what analysts were estimating in advance of guidance as of a few days (or so) before it was given. “Pre-release” (everything that’s not labeled pre-guidance, to save on clutter) is what analysts estimate for the recently-concluded fiscal quarter (in this case, FQ4 2015) with the benefit of management guidance, shortly before the earnings report. So, as usual, we focus on the lowest three lines. Well, what have we here? A distinct lack of movement from analysts in the past three-ish months. Oh sure, there’s been some variation, but on the eve of the earnings announcement, analysts moved up their expectations just a tiny bit. Superficially, Wall Street consensus is just a “touch” over top-end management-guided revenue, and a “negligible” delta from July to October. But it’s actually MUCH greater than it looks – if I remember to, I’ll return to that point in a bit more “detail”. Hint: It involves iPhone. Or, maybe 6-7 million of ’em. What? You were thinking I was about to make some wisecrack about iPhone doom? 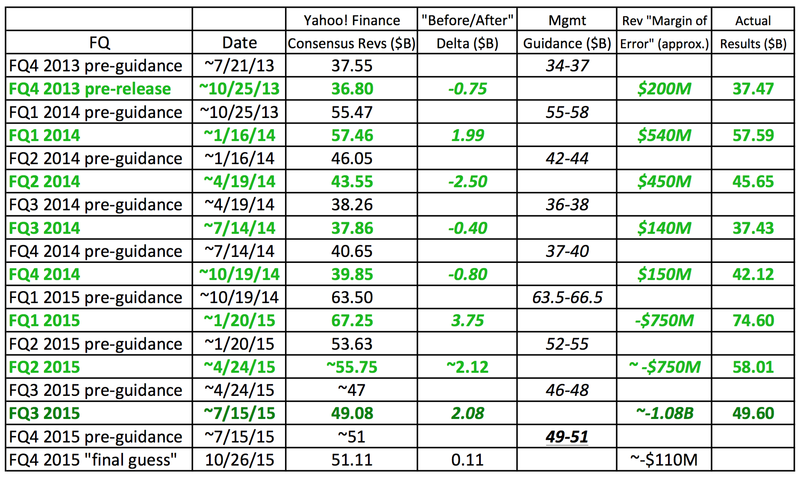 By the way, it doesn’t look like “the consensus” on Wall Street’s much more bullish on iPhone, yet. Last I heard, unit growth expectations (I presume FY ’15 to ’16) were in the 2-3% range. • a.k.a. the quarter Apple returns to Earth. Or something. So, Apple “goes through the motions” of a $50-$51B-ish wrapup quarter – shattering all kinds of September quarter records in the process. Ringing up, oh, I dunno, $230B and change in revenues for the full fiscal year, and rewriting the corporate net income record books. But, y’know, “it’s really not that important in context”. Which…has more than a grain of truth, but…wow. There was once a time where making $50B in aggregate revenue over any interval seemed so very far away for Apple. 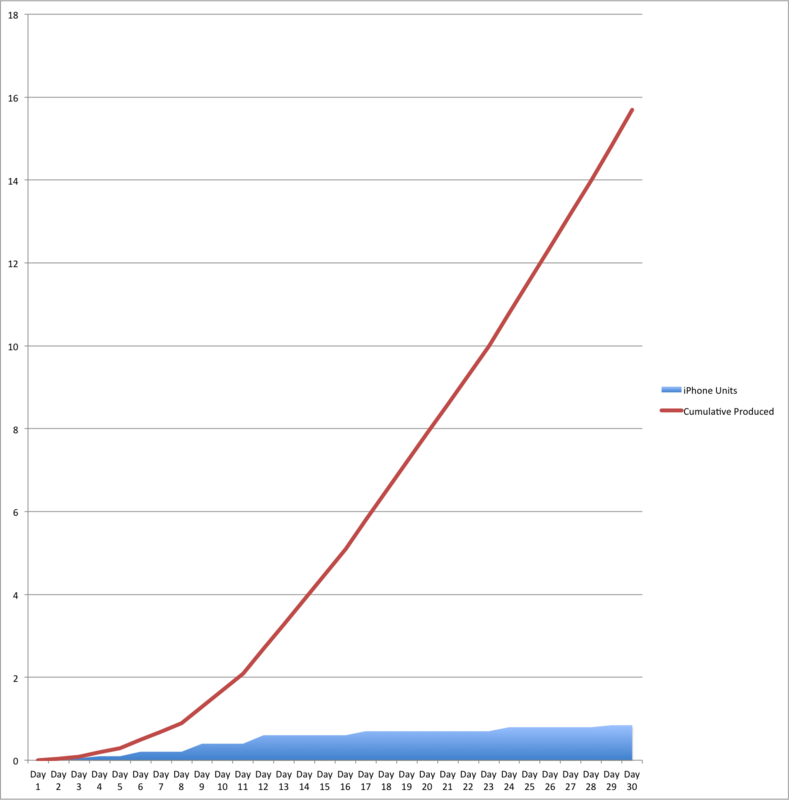 And now, $50B in 13 weeks? Yawn. Running the ranges yields: About $9.81-10.83B in net income, implied EPS of about $1.72-$1.89 based on 5.72B shares outstanding. By Apple’s estimates, revenues could grow by as much as 21% YOY, and net income by as much as ~28% YOY. As transition quarters go, this is mightily impressive, especially considering Apple’s entry into $200B+ annual revenue space. As before, I’ll have some astoundingly non-profound home game comment on non-iPhone assumptions, then slightly less astoundingly non-profound comment on iPhone and Watch. Is -18.8% unit growth too pessimistic, since iPad mini 4 is the first meaningfully new iPad (in terms of processor upgrade) since iPad mini 2, with iPad mini 3 not having launched until late October (FQ1 2015)? Could be. We’ll see. Mac – Mac has fresh product where it counts, and it continues to grow. It’s almost certainly going to ring in revenue of over $6B, considerably more than iPad for FQ4 2015. How about…$7B? Would that be an all-time quarterly revenue record for Mac? It seems out there in this post-PC, lower-ASP-megatrend-seeming world. On the other hand, iPad’s weakness is theoretically to Mac’s benefit. And Apple doesn’t really care which does better, as long as both mainstream computing product lines remain relevant. Services – It keeps growing as long as iPhone does. Oversimplifying, but you don’t have to be terribly precise when iPhone growth is this much of a growth driver for Apple. Other Products EXCEPT Apple Watch – Oof. Tough to figure out. With the new Apple TV joining this category soon, it won’t get any easier. Will Apple take this opportunity to something like, say, cull channel inventory (it does sell Apple accessories to many, many other retailers) to perhaps-not-entirely-coincidentally make solving for Apple Watch that much trickier? Hmm. As with iPad, all of Other Products will get interesting in a seasonal way in the current quarter. Now, a quick look at iPhone and the revenue mystery of Apple Watch. ASP was interesting. It actually managed to beat the prevailing trend, where FQ3 ASP was always less than FQ2 (in the timeframe seen below). This time around, ASP increased sequentially. By only one US dollar and change, but you can visualize how that would change the look of this three-months-old chart. So…what about FQ4? Two slight drops, one iPhone 6-fueled trend reversal. I decided to go with an ASP drop of $10 for conservatism purposes, and let’s just say it includes some “accounting” (heavy air quotes) for unfavorable ForEx as well, shall we? $650 it is, for me anyway. That leaves units. Growth rates this fiscal year, YOY terms, from FQ1-FQ3 were: 46%, 40%, 35%. And…? Now to get an oblique clue as to “missing” iPhones, seven days’ worth, not appearing in FQ4 results. Very Shaky Math Step One: Subtract 3.5M units on a YOY compare basis from this data set. Yep, iPhone sales only counted through Saturday, and Apple’s press releases since 2012 have counted Sunday. What’s that? Sunday a slower sales day, since most home deliveries don’t occur that day, shops close earlier, etc.? OK, that’s why I didn’t just divide 13M+ by three. Also, don’t forget about the newly discounted iPhone 6 and 5S units that got sold on Sunday as well, all of which, by means of segue setup, count towards FQ1 2016. Even Shakier Math Step Two: How many iPhones could Apple have sold in the six days that followed? Red line’s cumulative iPhone units produced, blue “shaded area” a dart toss on units produced in a day. Say Apple is somehow planning on selling 90M iPhones in a quarter – more on the holiday quarter later. 90 days, 1M iPhones would seem to be somewhere close to peak production output. Then again, iPhone mix is surely not 100% new-gen product, even in first full quarters of availability. Not even close. So, let’s say Apple gets to a max production rate of around 900,000 iPhone 6s/Plus units (combined) per day, before, amusingly enough, reducing production the rest of the year (as it’s done the past few years). Could that mean over 5 million additional iPhones that don’t count for FQ4, and get added to FQ1 2016? Maybe not, but 3-4M 6s/6s Plus units? Quite possibly. Add it all up and you could have, I dunno, 6-ish million to 8-ish-plus million 😀 iPhones, mostly of the highest-ASP variety, that “could have” counted in FQ4, but didn’t. Why Apple delayed the launch a week, we’ll never know, though high-level “financial engineering/calibration” can’t be ruled out, in my tinfoil opinion. In any case, you have a significant iPhone headwind to account for. $4B? $5B? Who’s to say? It’s not a net amount, but it’s obviously too large to not account for…somehow. Given that, is 23% or so iPhone unit growth too aggressive? Analysts appear to be leaning in the ~20% unit growth direction – it’s unclear what weight they’re giving to the headwind I mentioned above, which surely hasn’t escaped the notice of most. My “surmise”, if you can call it that – 20%-ish iPhone unit growth is not necessarily…overly aggressive. Apple knew full well what it was doing when it issued its guidance. If it didn’t know it would release iPhone 6s/Plus “one week later” in July, the resulting impact would force a guidance revision given the magnitude of the revenue shift. Well, I haven’t seen any 8-Ks filed about it. Anyway, it’s really FQ1 2016 that piques Wall Street interest. We’ll get to that real quick at the very end. I lowered my ASP “estimate” to $550 from $600 for no other reasons than (a) additional conservatism (I mean, spare band and accessories sales help!) and (b) trying to understand why Apple Watch revenue (albeit blended with the rest of “Other Products”) seemed so “low” for FQ3 2015. 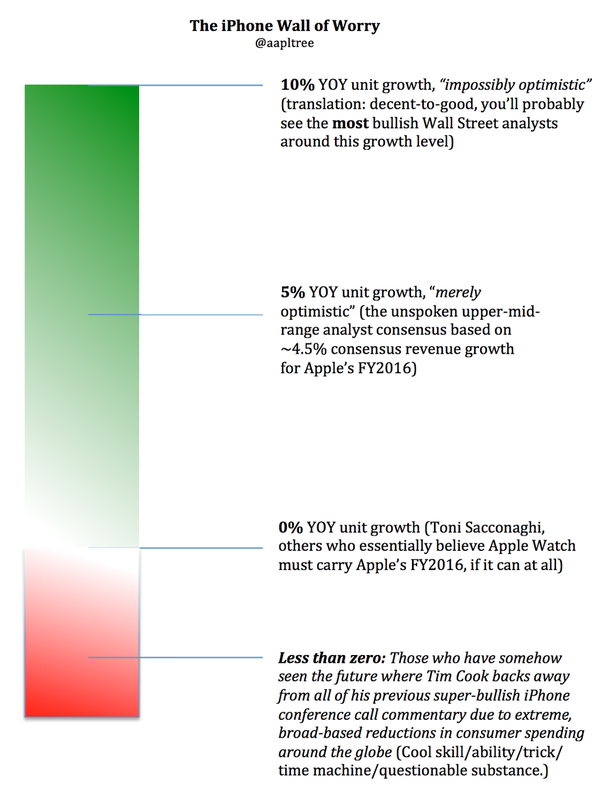 Apple is deviously good at providing “obfuscated commentary” on how their products are doing. Well, if we assume “Weeks 10-22” or so of Apple Watch tracked similar-to-or-better-than iPad’s Week 10-22 of sales? Eh, a guess of 3.95M Apple Watch units could be worse. Will Other Products be reported at around $4B for FQ4? Not long now until we find out. Finally, a “bonus” home game estimate and a very quick look at FQ1 2016 expectations to wrap things up. This is without the benefit of millions of iPhones, as I mentioned above. 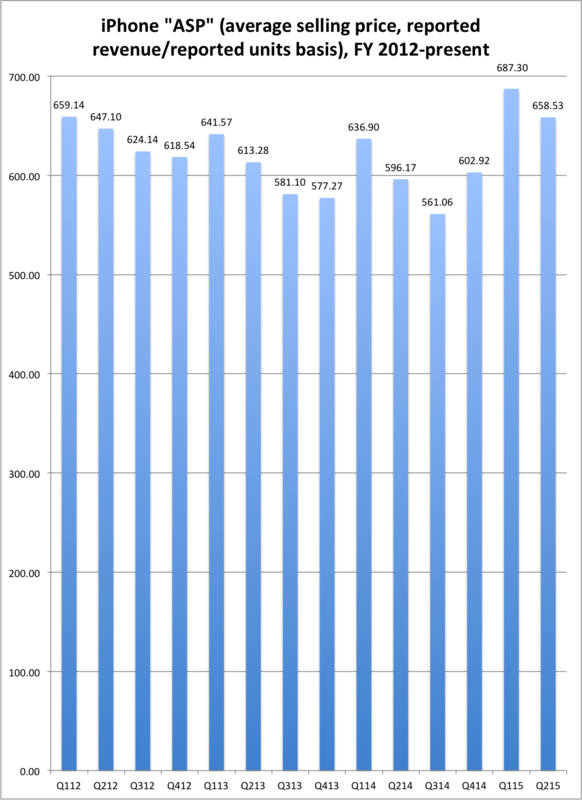 And if Apple reports a much more “mundane” $49B-50B in revenues tomorrow…well…there’s a huge part of the reason why. …to barely over 3% in FY 2016, depending on who you ask. And yet analysts see rev growth of 5.2% by September 2016, a massive deceleration. When you consider iPhone unit growth expectations (“consensus” basis) are probably still under 5% unit growth, plus inevitable ASP decline concerns (just wait)…analysts could well be thinking Watch of all products is Apple’s primary growth driver. This all goes back to FQ1 2016, which sets the tone. Which analysts see as dull and uninspiring. 3.3% revenue growth as of the date of this post, vs. $74.60B in FQ1 2015. Why? “Because iPhone grew too much”? Because of some fear of “saturation” even though the Great iPhone Replacement Cycle isn’t even half-over yet? Hence my title. Fears of halted growth trajectory. A product you can’t trust to keep growing units year over year, not any longer. By extension, you can’t trust Tim’s bullish comments on iPhone, repeated over and over and over again, can you? Hey, it’s Apple. People think strange things about growth prospects (typically, too bearish) when it comes to the company. You’ve seen the stock price go net nowhere, and really net down, over the past several months. My highly unreliable guess is that iPhone growth slows to more like 10-15% than 3-5%, but we’ll need a good quarter or two to get a sense of which guess is more correct. There is something curious though, a parting thought to wrap up my 10th Apple earnings preview post (yay, who cares) decently well. So about those, I dunno, “7 million missing iPhones“. They account for $4.2B in sales, easy. And they’re carried over to FQ1, essentially. Fine, I’ll make it 5 million iPhones for $3B in revenue to be more cautious. Wall Street, are you kidding me? Or is the joke on me for being too Pollyanna-ish? Guidance will give a big hint in a little over half a day. Mav, what’s your estimate for guidance? Thanks for the post!